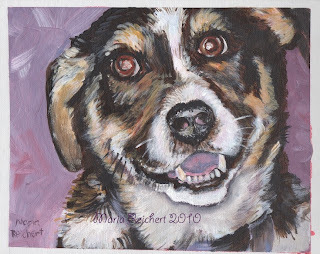 dog painting in acrylic 8 by 10 inch on canvas board "Snickers"
Now, I am very sorry if you thought I was going to write about chocolatey candy bars based upon my title, Snickers is the name of this dog that I have been working on this week. I painted him on 8 by 10 inch canvas board. And yes I have opened up the acrylics again! Now on this journey into my box of acrylic paints I have discovered that acrylics are very forgiving. I can erase! I can change the color of my background, I can make the eyes smaller if I paint them too large, I can change the color of the tongue if it is too bubble gum pink, I can't do that with watercolor! Now this may be both a blessing and a curse, because I am not sure I will ever finish a painting in acrylic due to the syndrome of "If i just change one more thing, it will be perfect...."
Also wanted to let you know that on my artistic journey, on the advice of Dreama http://www.artistmentorsonline.com/?page_id=1812, about finding your artistic voice, I am going to paint 28 paintings in 28 days in the month of February. 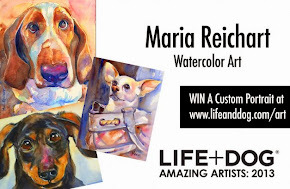 In her blog she discussed the need to paint to discover your own style and I am going to see if it works! I have been gathering photos from my photo boxes and will paint whatever catches my eye, daily, and my goal is to have 28 paintings by the end of February. My fellow artist and blogger Gretchen Bjornson: http://gretchenbjornsonart.blogspot.com/ will be sharing this goal, in that she will paint 28 days of flowers, so you can follow along and see what you think. Or better yet join in! Suggestions or photos to paint are welcome! Let's see where this road takes us. One of these days I'll dabble in my acrylics again. Snickers looks good. After painting the monster truck I felt the same way you did. Acrylics are much more forgiving and predictable than watercolors. They are much easier to work with, however, there is something magical about watercolor and the way it moves on the paper and changes with the water and brushwork.....wouldn't you agree? Gretchen, that is exactly how I felt, easier to work with and to correct a mistake, but somehow missing a certain....something! Snickers is darling, you have beautiful handling of the acrylics. Good luck with your 28 day project, it's a wonderful goal! Thanks Dana, I appreciate your comment, I am a big fan of your work. I would love to take some acrylic workshops at some point, so much to learn!! Snickers is adorable! I'm looking forward to following your 28 paintings in 28 days! I'm glad you're having fun with acrylics! I agree with you that acrylics are forgiving, and I like them because they dry so fast, but watercolors are so luminous and beautiful :) Someday, I will get my watercolors out again and see if I remember how to use them! Theresa, I think I will mix it up in February and do some acrylics and some watercolors, may need to buy some more acrylic paints to have better color choices, but it will be an interesting month! Someday, I want to try something big, I love your big paintings, it must be a lot of fun to paint nearly life size!